Mytre and I had quietly listened to the Arcturian’s latest Transmission to Earth. We realized that this message also meant that we would soon be bi-locating to the timeline of our Pleiadian ascension. Mytria had been telling me about that timeline, as I had forgotten it. Actually, I had forgotten that timeline because it was too painful to think about while I was so far away from my home. However, as Mytria filled me in on how I, too, participated in that reality, the old guilt that I had carried was completely released. Of course, just as I finished that thought, the Transmission ended and the Arcturian turned around to address us. "We are pleased that you understood how this message applied to you as well," the Arcturian telepathically said with that glint in Its aura. I was beginning to interpret a form of emotion that is transmitted by our dear friend, not through facial expressions but through fluctuation in Its aura. "Yes," the Arcturian again responded to my thoughts. "You are realizing that all Life is, indeed, an energy field. Some life is encompassed by a lower dimensional holographic encasement. However, once returning into the higher dimensions, the restrictions of form are instantly replaced with the freedom of a mutable Lightbody. "Here on the fifth-dimensional frequency of the Mothership, there is little differentiation between physical form and Lightbody, as they constantly intermingle. However, in the higher frequencies of the Ship, we fully relax into our myriad multidimensional expressions. Much as you and Mytria take off your Uniforms and relax into something more comfortable, we relax into our Lightbody, or even our pure Essence. "Since we meet with many Beings, cultures, and frequencies of form, we usually wear a body when we are interacting with our visitors. Of course, there are some visitors who never enter the fifth-dimensional level of our Ship, and go directly into the higher frequency levels to which they are better suited. Since you and Mytria are about to engage with the ascending humans, as well as the ascension timeline of your own society, you will usually be wearing your humanoid body. "Are the two of you ready for bi-location to your Pleiadian reality?" “Will we now create another reality in which Mytre and I are together during our ascension? Also, will this reality of our being together during the ascension somehow supersede or rewrite the other Parallel Realities? I must admit that I am still a bit confused by the concept of Parallel and Alternate Realities." “You will also realize that your Lightbody does have a semblance of the form of your lower frequency body, whereas your true SELF is a swirling pattern of light. “We will now guide you through an exercise by first being your example. You are accustomed to perceiving us in our Lightbody form, which has a semblance of a humanoid form. Watch now as we release that illusion and present our true form…"
Mytria and I watched in wonder while the illusion of the Arcturian humanoid form began to unravel into an ever-expanding vortex of light. At first the vortex was only a bit larger than the former form, but it increasingly grew larger and larger. Before we could realize it, Mytria and I were completely encompassed by the Arcturian's swirling pattern of light. It is difficult, if not impossible, to convey the sensation of being inside of the Arcturian. I once had that experience while the Arcturian wore its Lightbody. However, even though Its Lightbody was of such a high frequency that it took my breath away. That experience was mild compared to this one. Mytria and I instinctively held hands to double our grounding force, as well as to assist each other to remain conscious. This energy field was so very high that we were concerned that it would short-circuit our neural patterns. Fortunately, with that thought, the Arcturian lowered Its resonance just enough so that what was beginning to feel like we were disarticulating, slowly took on a feeling of unconditional love and total bliss. We were in complete Unity, not just with the Arcturian, but with the Mothership, as well. We felt absolute unity with every element of life on the Ship. As our experience began to expand into the higher frequencies of the Ship, I became concerned for Mytria. Fortunately, within our total Unity, she felt my concern and reminded me that she had experienced being in the swirling form of a planet. In fact, as she sent me that thought, I completely felt her experience of Being a Planet. “I could feel the Arcturian guiding me to surrender into that feeling. Instantly, I WAS our Pleiadian PLANET. In fact, I felt my impression of Being the Planet simultaneously with Mytria's impressions. Within the same moment, I was also the entire Mothership. The frequencies of the Mothership that I could barely tolerate before, now felt warm and embracing. I could feel how Mytria’s consciousness of swirling energy was of a slightly different tone and hue than mine. Within the same NOW, I could feel how the Arcturian’s experience of Being the Planet was very different from Mytria's and my experience, yet augmented them both. At first I was confused by the myriad stimuli and was beginning to "fall out of the experience." However, Mytria projected her familiar reassuring energy into me, which instantly grounded me and allowed me to LET GO into the Flow. As soon as I released my old warrior suspicion and defense mechanism, I began to relax into the Flow. It was then that I began to fully feel my own swirling energy patterns. Then, I could simultaneously feel Mytria's swirling pattern and that of the Arcturian. They were different, but blended into a beautiful tapestry of light. Within the NOW of the ONE, we were all unique expressions of the Grand Unity of Life. I discovered that once I totally surrendered into my own energy, there was a quantum jump in my sensation of sharing two other experiences. Once I had released my concern that I would become lost within the others, instantly, there were NO others. There was only ONE expression of “WE.” We were completely intermingled into ONE, yet WE were fully aware of each of our Divine Sparks, from which the swirling patterns of light originated. Within exact Unity, Mytria and I simultaneously KNEW every aspect of Parallel and Alternate Realities. We knew this because WE were the living possibility of every decision made manifest by our actions. We knew this because WE were ALL the living alternate expressions of SELF in every reality. With this realization, our experience slowly came to its conclusion. Together, we observed as our vast swirling energy patters coiled back into our Lightbody. 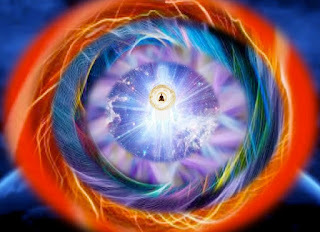 We then experienced how our Lightbody slowly constrained itself back into the lower, fifth dimensional form to which we had been limiting our sense of SELF. As the holosuite came back into focus, we felt the Arcturian whisper into our Heart-Mind, "We are so pleased to have shared this experience with you. Soon, you will share it with others." Thanks Sue, this is exactly what I needed to read/hear as a confirmation to what I AM/WE ARE. Now, I am sure it was not just my imagination...or better...my imagination is far more real than my current reality/human core in the here-and-now of this incarnation. THANKS again for channelling and sharing the WHOLE. I do appreciate! I have been enjoying your series of remembrances, Sue. Reading number 7 today about how when we are formless, we would appear as a swirling vortex of light really resonated with me. I had a thought suddenly bolt in out of the blue, concerning the "Miracle of the Sun" at Fatima, Portugal in 1917. I realized that it was a distinct possibility that Mother Mary was showing the people that day her formless expression, a truer expression of who she is. Her great light may actually have temporarily eclipsed the sun and provided an amazing display of both colors, and movement that left the poor crowd awestuck. Thank you Sue and the Arcturians for these messages! I've been following them for almost an year and I feel these experiences as mine too. We are all one indeed!Namaste! That is cool......resonating in form to,,,,,,equalizing pitch.....harmonics...our dna is Light. Mytre and Mytria’s good fortune with Arcturians is very interesting to follow. Sometimes we feel very lost with new concepts. The higher fifth dimensional form. I think one day we will meet. There, you will explain to us in a simple and understandable terms. May be!